Sovereignty-the authority of a state to wield ultimate power over its territory, its citizens, its institutions-is everywhere undergoing change as states respond in various ways to the challenges posed, from above and below. "Above" the state is the widening net of international institutions and treaties dealing with human rights, trade, investment, and monetary affairs; and "below" it are rising claims within states from long-resident groups discontented with the political order and from new migrants testing its authority. Sovereignty under Challenge deals with a range of such challenges and responses, analyzed in authoritative studies by leading scholars. The introductory chapter sets forth the theme that sovereignty is asserted clearly, but often unpredictably, when governments respond to challenge. It suggests ways of classifying these responses as variables that help explain the changing nature of sovereignty. Part 1, "The Citizen and the State," treats the rising tide of dual citizenship and the concerns this arouses in the United States; the work of national human rights commissions in Asia; and the challenge posed to the state by the Falungong movement in China. The two chapters in Part 2, "The Government as Decision-Maker," examine Japan's response to global warming and the problems of the World Health Organization in orchestrating collaboration among Southeast Asian states in implementing infectious disease control. Part 3, "Sovereignty and Culture," looks at conflicts engendered by outside change on indigenous economic, cultural, and legal institutions in India, Fiji, Indonesia, and Malaysia. 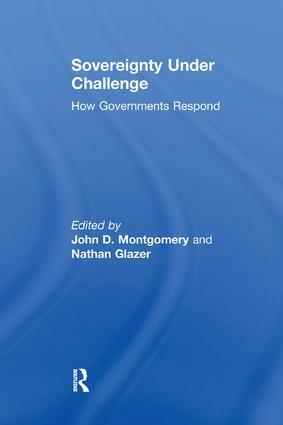 The chapters in Part 4, "Sovereignty and the Economy," analyze the economic and cultural instability induced by Chinese migration to Russia's far east; the impact on state sovereignty brought about by transnational regulatory campaigns and social activism; the question of indigenous land rights in the Philippines; and the impact of transnational corporations on information technology in Asia. A concluding chapter offers a global assessment of the current status of state sovereignty.